(Newser) – Kapoho Bay's famous tidal pools, eaten up by lava from Hawaii's Kilauea volcano this week, were apparently only dessert. On Saturday, Hawaii's largest freshwater lake disappeared in hours as lava rushed into it, reports NPR. 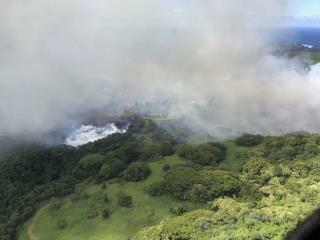 On its way to the ocean, the lava flow sent a plume of steam into the air as it hit Green Lake, a popular swimming spot, around 10am Saturday. Within five hours, the lava had filled in the lake, up to 200 feet deep, and "boiled away the water," USGS volcanologist Sally Sennert tells NPR, expressing doubt the lake will ever return. "I couldn't believe it," a college geography instructor says, per CNN. "I've never even heard of anything like that happening before." Another science fail. Before the lake there was lava. Before the lava was salt water. Salt water still evaporates to create fresh water fog and rain. We still have gobs of salt water, and the lava where the lake once was is still there. Seems a pretty good chance the lake will return. More amazing is it only took a few hours.